Businessman and five-term United States Senator from Arizona who was the Republican Party's nominee for president in the 1964 election. He was known for his work in defense policy while in the Senate. He took over the family business although he had almost no relationship with his father. He lost the 1964 election to President Lyndon B Johnson who, riding a wave of good will following the assassination of his predecessor John F. Kennedy, attained the largest percentage of the popular vote in US Presidential election history. 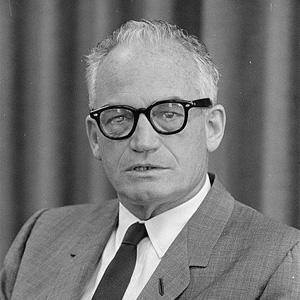 His son, Barry Goldwater, Jr., became the first congressman to serve alongside his father in Congress. His unpopularity greatly hindered his presidential campaign, unlike LBJ, who effectively related himself to John F. Kennedy's popularity.